Every single day, we are exposed to innumerable amounts of audio and visual input. Really, that input possesses no meaning whatsoever. It’s how our brain processes the data that gives the input any sort of meaning or context. Some savvy creatives (or depending on your viewpoint - scheming creatives) understand this, and have been known to apply that knowledge to many forms of media over the years. As consumers, we all have been subjected to hidden messaging. Those communications have been in the form of subliminal messages and supraliminal messages. Before we take a deep dive into those types of messages, there is one critical concept that must be understood: The concept of absolute threshold. Absolute threshold is the degree of intensity required of a stimulus to be detectable by the human senses 50% of the time. Here’s an example: Imagine you enter a very dark room from a well lit room. It takes a few moments for your eyes to adjust. As your eyes are adjusting to the darkness, you notice a lit candle. The moment you are able to perceive the lit candle is the absolute threshold. The absolute threshold is the smallest amount of light that you can detect. Most people are familiar with subliminal messages. Subliminal messages are defined as signals below the absolute threshold level of our conscious awareness. That means that you cannot become consciously aware of a subliminal message, no matter how hard you try to detect it. So, while you may have heard many stories about subliminal messages in advertising, these may not have been instances of subliminal messaging at all. 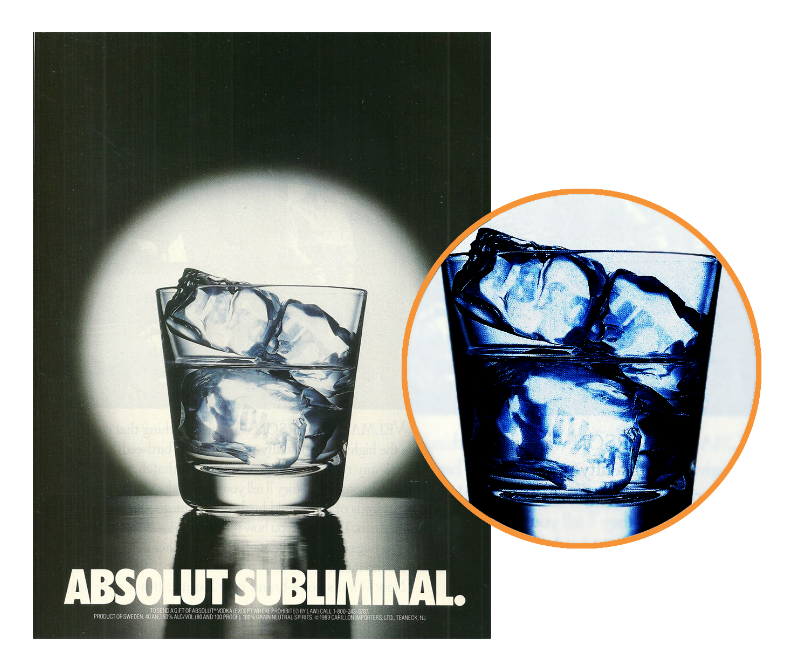 Take for instance this ad from the big brand ABSOLUT VODKA: There, in bold letters, is the word “SUBLIMINAL”. But, you can easily see their supposed subliminal message, quickly disqualifying it from being subliminal. Remember, you cannot consciously perceive a subliminal message. When it comes to hidden messages in ads, it’s more likely what people have experienced are supraliminal messages. These are signals that we are able to detect consciously (although, we fail to notice them most times) because they are perceived above the absolute threshold. Usually, when you hear stories or read posts about “Subliminal Advertising,” they are usually supraliminal tactics. Here’s an example: In the late 1990’s, a study was conducted in a British supermarket. Over a two-week period, German and French music were played from a display featuring German and French wines. On the days German music was played, 73% of wine that was sold was German. On French music days, 77% of the wine sold was French. That means that if you were at that supermarket during their test buying wine, you were 3 to 4 times more likely to purchase wine that matched the music. While the music’s influence on the buyer’s behavior was enormous, 86% of the participants said that the tunes had no effect on them. This is a prime example of supraliminal messaging - the external stimulus was able to be detected, and there was a behavioral effect to boot. Another example of supraliminal messaging that many have called “subliminal” is a 2008 ad for the KFC snacker chicken sandwich. About 25 seconds into the ad, the video cuts to the sandwich. For just a brief moment, hidden among the green leafy lettuce, is a one dollar bill. It was very fast, but still, many people caught it and public hysteria ensued. There were conspiracy theories, blog posts and passionate groups ranting about KFC sending us all subliminal messages about their inexpensive sandwiches. Not long after the release of the ad, a blog post on the Chicago Tribune website stated that it was a publicity stunt rewarding those who saw the hidden bill with a free sandwich. Regardless, this was a supraliminal message that elicited a response - mission accomplished. Of course, hidden messaging finds its way into packaging. There a loads of examples, but here are a few from some brands you might encounter on a semi-regular basis. Toblerone, the famous triangular Swiss chocolate treat, is from Bern, Switzerland. Bern, Switzerland sits in the shadow of Matterhorn Mountain, and the city is also known as the “City of Bears.” So right there, for all to see (if you look closely), one can find the roots of the company hidden cleverly in their logo. Additionally, there’s no doubt you have received a package from Amazon, and there’s no doubt you have noticed that the arrow makes a smile. But did you notice that the arrow is pointing from A to Z? Reminding consumers of the wide range of products one can find at Amazon? Well - now you know - and when it comes to hidden messaging, knowing is half the battle! Ready to learn more about human factors in packaging design? Head on over to https://www.packagingschool.com/human-factors. Older PostHow Does a Piece of Corrugated Board Become a Box?